I didn’t really know anything about Dr. Strange when my son and I went to see it in IMAX 3-D the other day. I’ve heard that people have had issues with the movie on a number of fronts, but we enjoyed it. Cumberbatch was great and I loved Tilda Swinton. But, if you’ve seen it…you know who made me cry. For the unfamiliar (like I was), Dr. Strange is this incredible surgeon whose steady hands have lead to fame and fortune. His hands are his livelihood. So, when he crashes his sports car and destroys both of his hands, it’s all over. His identity is lost, no matter what those around him say. He goes to great lengths to try and repair his hands, all to no avail. Finally, he is told he needs to go see “the Ancient One” who will show him how to harness his spirit/energy to repair his physical body. 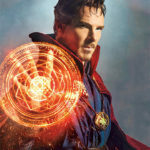 Once he starts, part of his training consists of a lot of hand movements to create portals to other dimensions, as well as shields and weapons. He’s missing one of his hands. He performs the task perfectly and I start to cry instantly. Not sob, but an immediate welling of the eyes. Why? Over the past couple of years I’ve come to understand the importance of seeing someone who looks like you on the big screen. In this case, the message was powerful, too. Your physical condition does not have to limit you. Dr. Strange reminds me of so many kids and adults I’ve come across. He was more focused on his physical difference than was anyone else around him. It was a process for him to get to that point where he accepted his hands for what they were and realized he was strong regardless. I’m not sure I’d say that was the main theme of the movie, but it was the one that most resonated with me. I’m hopeful it will resonate with others, too. Especially those finding their strength despite their physical difference. As a guy who only has the use of his left hand due to a stroke, bravo. I can relate fully, I might not have the same thing as you but the end result is similar. I don’t know about your case but in mine it’s a constant battle getting people to stop feeling sorry for you. Not to stop the compassion but the feeling sorry for you, its a big difference. I’m no longer in a wheel chair, I can walk on my own. I can no longer do the labor intensive work anymore but there is lot’s to do! I didn’t see the movie yet but I’m going to thanks to you’re suggestion (with a new attitude). Thank you!